It will be the 71st edition of the Avignon Festival from July 6 to July 26, 2017, so we at Musement thought it would be the perfect opportunity to visit the city and its surroundings! Oh Avignon, Avignon…The city is literally built into French cultural identity. 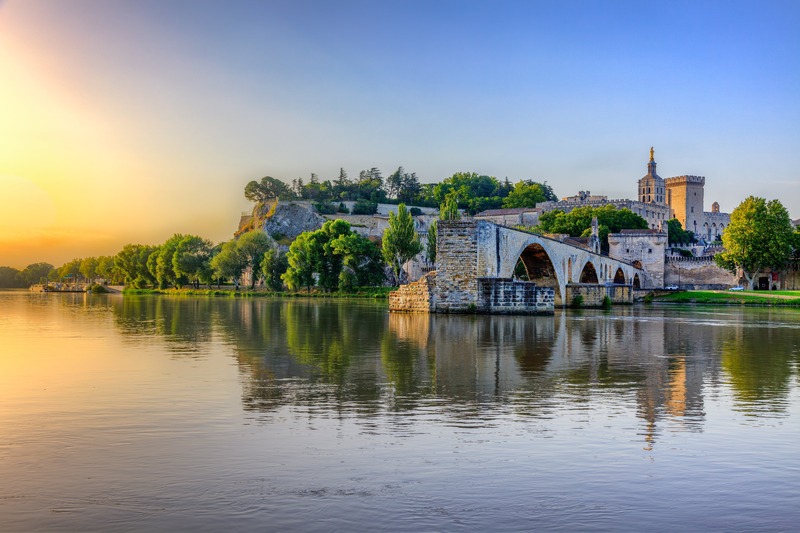 From the children’s fairytale “Sur le Pont d’Avignon” and Picasso’s “Demoiselles d’Avignon” to the evocation of the City of Popes throughout history, Avignon has always been a part of the education of every single French kid. With a rich history and it being listed as a UNESCO world heritage site, Avignon comes to life each summer during the theater festival that takes over this artistic city every July. In this year’s editorial piece, Olivier Py places the festival under the sign of hope and fills spectators with a sense of optimism and determination against the despondency, defeatism and fear that are slowly eating away the country. “We don’t build the future with stones but with words. We don’t build hope with steel and concrete, we do it with words,” he says. After the events that swept France in recent years – especially Nice, during last year’s festival – this edition wants to be a beacon of hope in a world where “times are too harsh,” in the name of “fraternity,” “freedom” and “equality.” And since it is the spectator – in other words, you and me – who actually turns the festival into a living entity, it is also up to us to experience hope! But first and foremost, the Avignon Festival stands for the famous Festival In, the official festival: over 60 international shows and about 300 performances in 20 different locations. This is the perfect opportunity to see a large number of performances over a relatively short period. The city becomes a true open-air theater, a creativity hub where a general effervescence sweeps the city in the form of a gigantic wave of artistic emulation. To access this year’s program, click here. And to book your tickets – which you really must do ahead of time if you don’t want to be left out – click here. 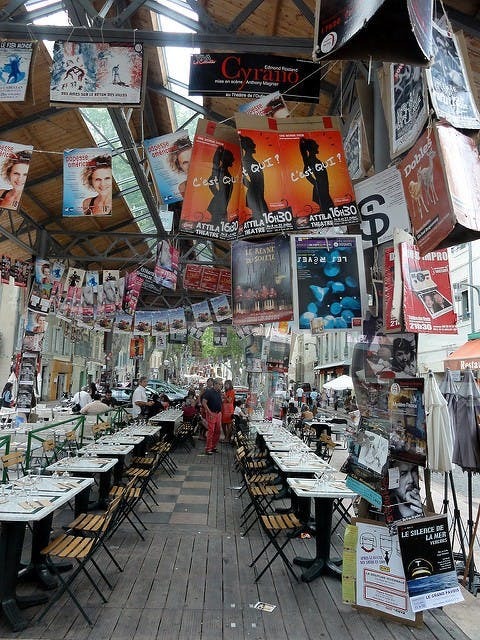 But Avignon in July is also (or, for most of us, especially) the Off Festival: a merry mess that sweeps the city’s streets, including Rue de la République, which stretches across the entire walled city. In fact, Avignon is one of the few French cities to have preserved its ramparts. Over 1000 artists set out on a poster and “tract” marathon and the citadel takes on a bohemian vibe, decorated with garlands made out of colorful flyers and posters. Everyone must do their own advertising to draw the crowds into their shows, and the competition is fierce! Actors and comedians must sell their personas and appear to the streets to be noticed, creating a whole month of living culture and celebration. This year’s Off Festival includes the irresistible Colocataires, who will delight audiences with their improv show. Don’t miss FIBS’s one-woman show ‘Sous Ma Jupe‘ (Under My Skirt) or the history of the greatest cheating expert of all time, Richard Marcus, told by Mauritius Douda, a magician of unrivaled dexterity. Check out our selection of Off shows and book them here. To fully experience the festival’s atmosphere, we recommend an afternoon stroll through Place des Corps-Saints, the place where all Off artists meet. This is an opportunity to have a drink in a jovial and relaxed atmosphere, and to meet all kinds of people. In between shows, or after an intense series of performances, concerts, readings and many other events, take the opportunity to explore the region. Avignon is the perfect starting point for extraordinary excursions into the heart of Provence, following the traces of ancient Roman buildings. Explore Nîmes and its arenas, Orange and its amphitheater (which is one of only three Roman theaters in the world to have preserved their stage wall), Saint-Rémy-de-Provence and the Glanum site. Then set off to explore the charming hilltop villages of Luberon, which offer stunning views of the surrounding landscape and the region’s typical lavender fields. 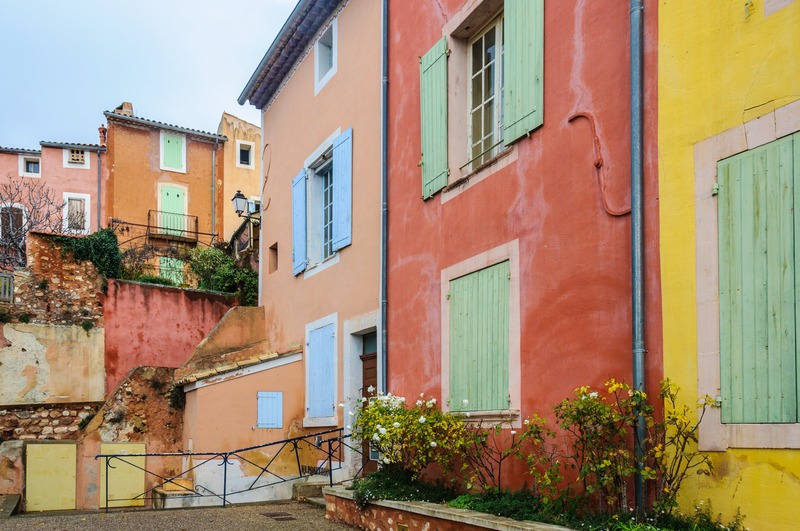 Enjoy the sweet life of southern France and follow the rhythm of the cicadas: stroll along Provence markets, be inspired by local smells and colors, stop for an ice cream or a crêpe while admiring charming sceneries. July is the perfect month to explore the area and travel scenic roads through Luberon’s olive groves, vineyards and blossoming fields. It’s the perfect time to take a leap into the past and discover grandiose monuments, reflecting the ingenuity of Roman buildings such as Pont du Gard, one of the best preserved Roman ruins in the world. Listed as a UNESCO World Heritage site, this ancient bridge is a true technical feat – a unique example of a 3-level bridge still standing today. Its uncommon size is equally impressive: this happens to be the largest – and best preserved – Roman aqueduct bridge in the world. One thing you should know: every summer, just 200 meters from the bridge, the right bank of the Gardon is arranged into beaches. A haven of peace and freshness, this is a nice place to bring your family or go for a swim with your friends, just doing nothing and having fun. But there’s more: the region has other surprises in store, such as the hilltop village of Gordes, Roussillon (one of the “most beautiful villages in France,” famous for its red and yellow ocher cliffs, as well as for its exceptional natural landscape) and Les Baux de Provence. You should definitely explore this village, which stands on a 245-meter-high rock, and whose historic center is pedestrianized. Let’s end this post with a place that I never fail to visit every time I visit the region – a timeless city, suspended in a warm and fuzzy atmosphere. I’m talking about Isle sur la Sorgue, also known as the Venice of Provence, where art galleries, boutiques and antique shops embrace a flowery scenery along a winding maze of canals and streams with a melodious flow. This city is home to “L’Ile aux Brocantes,” which is accessible through a small bridge. Every year this antiquarian village brings together forty exhibitors and a restaurant – in short, a paradise for flea market enthusiasts, a kind of giant amusement park specially designed for collectors and lovers of decoration and the recycling crafts.